0	0	Nearing Home	In Stock - Order before 4pm for same day dispatchWant it on Tuesday 23 April? For the generation that came to faith through the tent campaigns of Billy Graham, 'Coming Home' gives you a poignant and personal view from the man who pioneered that great age of revival evangelism. In this book that looks forward at least as much as it looks back, Billy Graham takes up his pen to share his experience of growing in faith and teaches important lessons on how to view your time here on Earth in the light of Heaven. The Bible, he says, makes clear that God has a specific reason for keeping us here, and growing older is part of God's plan your life within his purpose for you; God isn't finished with you yet, but you have to find what he has for you to do. Admitting, "I never thought I would live to be this old," he asks; what is God's purpose for you in your later years, and how can you align your life with it? How can you not only learn to overcome your fears, struggles and growing limitations but actually grow stronger inwardly in the midst of mere physical difficulties? As Billy Graham says: "In this book I invite you to explore with me not only the realities of life as we grow older but the hope and fulfilment and even joy that can be ours once we learn to look at these years from God's point of view and discover His strength to sustain us every day. I pray that you and I may learn what it means not only to grow older, but, with God's help, to grow older with grace." 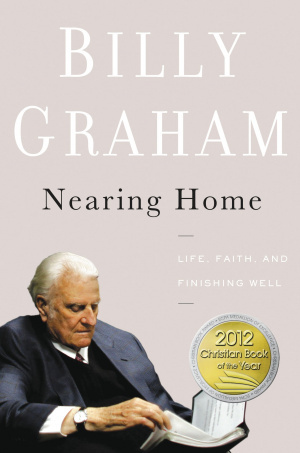 Nearing Home by Billy Graham was published by Thomas Nelson in September 2011 and is our 4325th best seller. The ISBN for Nearing Home is 9780849948329. Billy Graham is now 93 years of age. He writes with the same ‘voice’ that I heard all those years ago in my teens, in Wembley Arena. He touched my heart then and his wise words touch my heart again all these years later. He reminisces about his life and his family. Of his love for his wife Ruth who he misses so much, of his joy that his son Franklin continues the work of the Billy Graham Evangelistic Association and also leads the international Christian relief organisation Samaritan’s Purse. He has learnt the hard way about the physical limitations imposed by old age and recognises that many old people become bitter but stresses that it need not be so. He continually quotes from the Bible as he tells anecdotes about those he has met during his long lifetime, in fact in just this book, he writes so many wise words a little book could be compiled of these sayings alone, perhaps for those who are too infirm to manage the whole book. However I would like to stress that this is not just for those of us in old age, he writes as he has always spoken - for everyone. Take a peek at some articles related to Nearing Home. Is this available on CD, as an audiobook? A:No, unfortunately, Nearing Home is not yet available in CD format; it may be at some stage in the future though, so please do check back to the website often as further details will be posted there as soon as we have them.